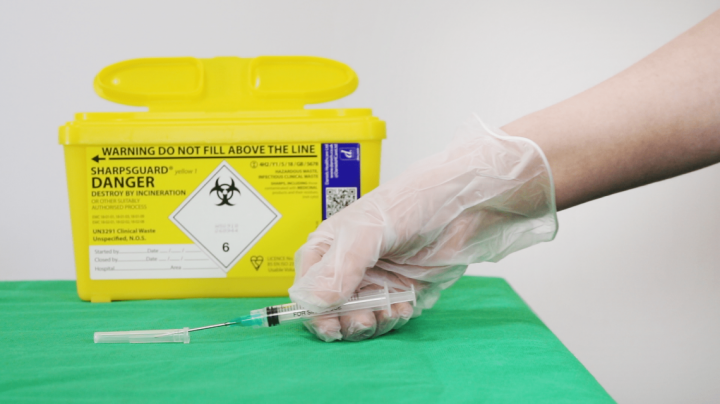 This Sharps Training focuses on the dangers associated with Sharps, the potential health risks and the handling and disposal of Sharps objects. It also looks at The Health and Safety (Sharp Instruments in Healthcare) Regulations 2013 and covers what PPE equipment is available. “Sharps” waste is a form of hazardous waste which includes any objects that are used to puncture the skin. These materials must be handled with care and safety. Annually, there are 16 billion injections administered both in and out of hospitals around the world. However, there are a large number of needles and syringes that are not correctly disposed of and these could cause harm to others. The NHS (Southampton) Sharps Safety Policy defines it as needles, sharp-edged instruments, broken glassware, razors, scissors, bones and teeth. Hence, Sharps is not just exclusive to needles as many think. Anything attached to needles and blades is also considered as Sharps waste and therefore, needs to be disposed of properly. There are dangers associated with Sharps materials as bloodborne diseases and infections can be passed through them. Some of the diseases connected with Sharps materials are Hepatitis B, C and HIV, but are not exclusive to these three. This risk is, logically, higher to those working within the healthcare industry, however, there are risks to people using needles and blades at home and work. The general public can be put at risk too from improper needle disposal from drug use. The Sharps Training course is broken down into 2 sections. “Sharps” is a medical term used for any item with sharp edges or points capable of puncturing or cutting skin. Sharps are mostly associated with medical settings like hospitals, but many people will use Sharps at home, at work, or whilst travelling to help deal with certain medical conditions – diabetes, for example. In this section, we'll look at some of the risks posed by Sharps and, most importantly, what you can do to help minimise them. The best way to deal with Sharps Injuries is to try and prevent them altogether. This means employers and employees working together to create and maintain a set of working practices and procedures which have safety at their core. In this section, we'll see how your employer's risk assessment should inform how you work, as well as looking at some best practice techniques when working with Sharps. This Sharps Training course concludes with a 20 question multiple choice test with a printable certificate. In addition, brief in-course questionnaires guide the user through the sections of the training and are designed to reinforce learning and ensure maximum user engagement throughout. Your Sharps Training Certificate includes your name, company name (if applicable), name of course taken, pass percentage, completion date, expiry date and stamps of approval or accreditations by recognised authorities. Based on 2 real user reviews. Read our full reviews for Sharps Training. This legislation was created to prevent Sharps injuries in the hospital and healthcare sector. It aims to protect those in the healthcare sector from bloodborne viruses. The Health and Safety at Work Act 1974 (HSWA) is also relevant as it sets out the general responsibilities that employers have for their employees as well as the public, and the responsibility employees have to one another. The Control of Substances Hazardous to Health Regulations, 2002 for assessing risks employees are exposed to by hazardous substances and aiming to prevent them. This also includes the use of protective equipment and reducing exposure. Placeholder image for How can you prevent and report drug administration errors?